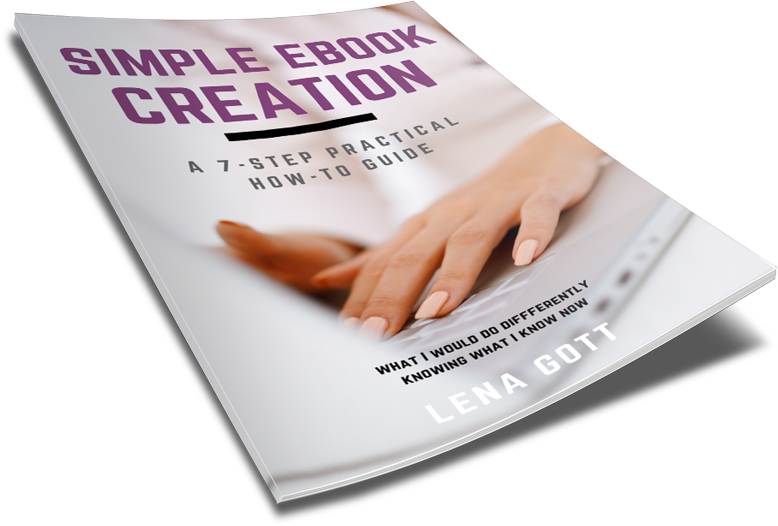 the 7-step practical how-to guide that takes all the guesswork out of creating your first ebook! There are so many things that get in the way of us just getting the darn thing done! Perhaps you don't know what to charge for it? Perhaps you don't think anyone will think it's worth buying? Perhaps you're confused on how to format it? Most of it goes back to fear (and lack of a clear step by step plan). Fear of failure. Fear of the unknown. Fear of being found out that you're actually a fraud who has no business writing a book! Does this sound familiar? Please tell me I'm not the only one! If you can identify with any of this, then this is the guide for you. When I was writing my first ebook, I agonized over every little bit for what seemed like forever. It took me MONTHS of procrastination and self debt and technical incompetence to get that thing launched. I seriously wanted to throw in the towel before I ever gave myself a chance. In hindsight, I was spending too much time on things that didn't really matter. I was over complicating the entire process, when there really is a system to writing a book and publishing it fairly quickly. This guide will take you by the hand and walk you through step-by-step on the journey of creating, publishing, and charging real money for your first ebook! These are all the things I would have done the first time if someone had told me that it was this simple. Simple Ebook Creation holds your hand & walks you through the process of creating a fantastic ebook. It prevents you from overthinking each step & getting in your own way of publishing on schedule! Having the ability to generate more income when you need to is the best part about being an entrepreneur. Ebooks bring extra revenue while simultaneously establishing your expertise in your field. All that is standing between you and a published ebook is a bird's eye view of the process so you can understand what needs to be done and when. I can't wait to see your published ebook!